To enjoy utmost drifting excitement, our coilver is the best choice and different from other coilover which is only ride height adjustable. All McPherson suspensions offer mono and inverted tube design (φ55mm). It can bear the sideway aggressive movement and strong gravity when drifting. There are some certain rear dampers should come with helper springs to operate the sideway aggressively, ground the rear inner tire, and against with ground when drifting. All McPherson coilovers come with pillowball upper mount with camber plate. It adjusts the camber of the tire and get the tires have better turn and enhance the stability of the vehicles. The specialized rear spring rate setup can make the inside tire to press down the road without affecting the stability of vehicle. Furthermore, it accelerates the rear tires turn around to drift handling for high-speed. The ride height can be dropped 60~100mm from OE ride height for your reference. There are 36 different damping settings to meet different requirements of race-road conditions and varieties vehicles. 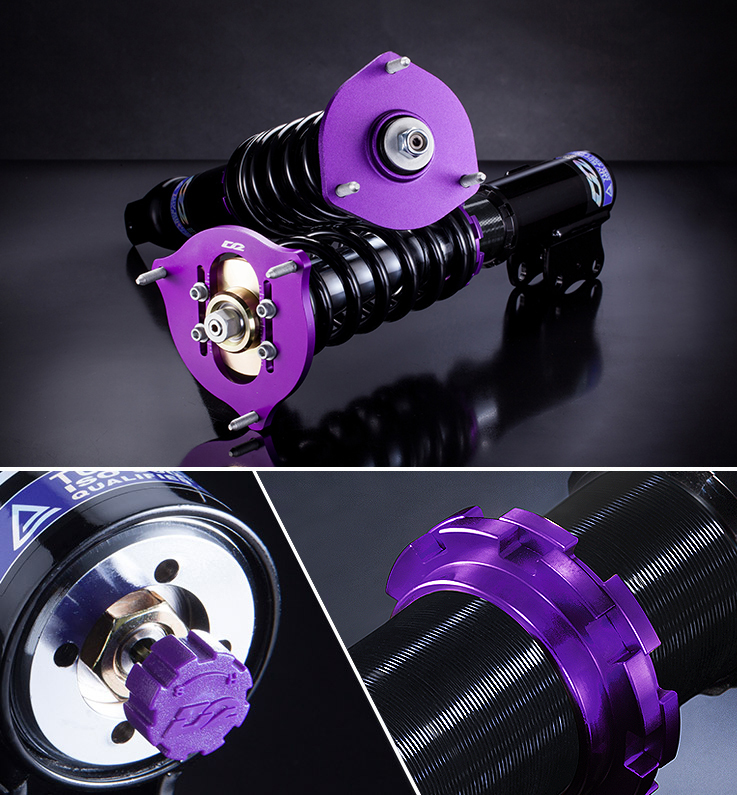 If there is no application desired, we can customize the coilover for you to meet the requirements. 3D pillowball top mount is able to adjust the camber and caster for customer options. All applications listed on our website are for 2WD model unless we specify 4WD. The "model year" defined for each application on our website might be different from the ones in each country; therefore, please confirm the "production years" with us if you cannot make sure. For certain custom racing strut, our company has right to determine to use inverted insert. The pillowball top mount can be adjusted the camber degrees and increase the handling and stability of your vehicle by 10%. However, it is easy to create some slight unusual sound when coming across a big bumps. The pillowball top mount covers no warranty. 3D pillowball top mount is able to adjust the camber and caster of front tires to increase the stablility and traction at the time. 3D pillowball top mount is required on McPherson suspension in SUPER RACING. Copyright (C) TW RACING PARTS INC.